This beautiful girl is named Tripod and is currently living in a Vet Clinic here in Alabama. She was brought in after being hit by a car, and was scheduled to be euthanized as no owners could be located and there were no funds to help her. 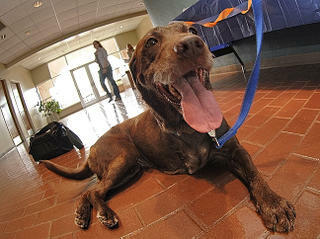 She managed to charm the right people though and survived surgery, though she lost her right front leg. She still gets around just fine, she can hop her up and down stairs and is rather happy and lovable. She is in need of a home however. At the moment she is being harbored by a group of Veterinary students. 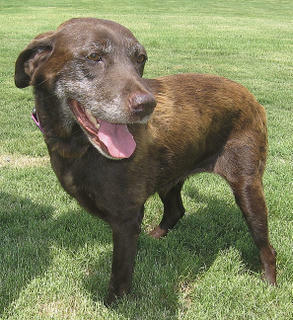 She is housebroken and gets along with cats, her approximate age is around 7 years. If you would be interested in taking her in email me at DCphotography@gmail.com and I'll send you the details. Believe me, she is very cute, lovable and well-mannered. you rock! tripod is too cute! awww...david that is so nice of you to do that and she is so cute! Does Tripod have a home yet? I'm not sure how I would manage but am interested anyway.. The latest update on Tripod is that she is coming home with me. My mother wants to keep her but is worried that she isn't able to walk her enough, so we are going to put a doghouse in her yard and I will keep her at my place also, sorta like joint custody. I am not supposed to have a dog in my apartment so I will see how that goes. There is a guy in Omaha that wants her, but we don't know how to get her there. If someone else with a good home steps up, we would be happy for her to find them!